In 2007, a band of dedicated Rye enthusiasts bought a farm — they actually purchased a plot of land in Vermont lovingly named Whistle Pig Farm. They teamed up with master distiller Dave Pickerell — formerly of Maker’s Mark — to bring genuine Rye Whiskey back to the forefront of American Whiskeys. It took a while, but they have now grown to become a true “estate producer,” which means that all aspects of their core Whiskey production are on site from growing the grain to bottling the spirit. They produce three award-winning core products and have experimented with a variety of finished wood Rye Whiskeys. This means quality production by MGP that is aged and finished at WhistlePig Farm in Port, Sauternes, and Madeira wood casks. 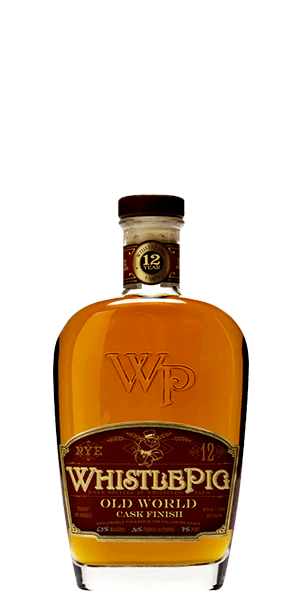 The key to the unique flavor character of WhistlePig 12YO is in the combination of the casks. After spending 12 years in new American oak casks, it is then finished in three European wine casks: Madeira, Port and French Sauternes. What the heck is "whistle pig" anyway? Even though all Whistle Pig Whisky labels are adorned with the sketch of a tuxedo-clad hog, "whistle pig", groundhog and woodchuck all refer to the same animal. What does WhistlePig Old World 12 Year Old Rye Whiskey taste like? The Flavor Spiral™ shows the most common flavors that you'll taste in WhistlePig Old World 12 Year Old Rye Whiskey and gives you a chance to have a taste of it before actually tasting it. Plenty of Rye spice with stone fruits, orange-blossom honey, and rancio. Long with dark chocolate and caramel. I love Whistle Pig, and this may be their best product. It's darn near perfect. Packs a punch up front, but not too heavy. Smooth finish, nice warmth as it goes down. A world class rye. Huge hit at guys night whiskey tasting. Big bold pepper spicyness with a long smooth almost sweet finish. This has quickly became one of my favorites! Great beginning. Stale vat finish. Not a huge fan but could sip this with a meal. It is an outstanding, rich Rye Whiskey with a rich birth; while a rich & complex life; leads to a long & rich death with notes of dark chocolate, caramel & a hint of smoke. This whiskey has ruined me. I've just learned to appreciate whiskey and now nothing compares to this one. It's good on the rocks but even better neat with a few drops of water. Caramel and fruit are the prominent notes. Price is similar to my local distributor. I picked up a bottle of a slightly different blend of this exclusive to a Chicagoland liquor store. Not sure how it differs from the standard release in terms of taste, but the one I have is absolutely fantastic. This is definitely something I'll be keeping in stock in the home bar. Sweet and subtle bite throughout. Smooth rye whiskey. This whiskey is definitely an acquired taste...that I haven't yet developed. I am not a fan of aging whiskey in various wine barrels. I want my whiskey to taste like whiskey and my wine etc. I'm embarrassed to tell anyone how much I spent on this bottle. Wish I could get my money back or a credit to spend toward something I would drink. Oh well, live and learn. I wish I could buy your bottle! I like your style Jennifer! Vanilla and spicy and everything nice. Excellent rye. I only got to first try Whistle Pig within the last couple of years out here on the 9th island. It quickly became a staple that is complex yet easy to enjoy and not completely overbearing. When Old World appeared I quickly got my hands on a bottle and was certainly worth the 30 extra bucks. Oh yes! This Rye is fantastic! Our favorite...we tasted and immediately drove to liquor store to purchase our first bottle...we try to keep several bottles at home...hard to find and hate to run out. Probably the best rye I ever had. Extremely smooth and easy to drink. Definitely worth the price. Will buy again. I really like this. It's smooth and has a great taste. This may become one of my 'go-to' Ryes. The only Rye I have ever liked! I wouldn’t mind having a bottle of this in my home bar! I was curious if the taste warranted the price; it does. Fantastic. Smooth in e front and a little spice in the back. VERY NICE! Really excellent in every way. Interesting, flavorful, smooth. One of the best whiskey's I've had. Sweet but not too sweet, nice spice, nice bloom, easy aftertaste. Overall an outstanding drink, a pleasure to drink neat or any other way you'd like. This whiskey has a great nose! With a luxurious mouth feel. The alcohol content is just right to warm you up on a cold evening. It has notes of honey and oak on the front, with tobacco and spices on the after taste. It’s a little pricey for me, but a very nice bottle to have for a special occasion! Excellent - typically direct people here after they've had Basil Haden's - again, to show them what just a little bit more money gets them in terms of quality. Tasted for Robert Burns Night. Very smooth, slightly sweet, good sipper on the rocks. It was ok. I expected more flavor. After setting out for about 20 min it does offer more flavor. Kinda like wine. Another solid offering from WhistlePig. Complex flavors, spice-kick, and is smooth with a nice prolong finish. Very nice and smooth.. I will keep a bottle or two always! It's a great whiskey and of course living in Vermont, I had to try it. I absolutely loved it but I don't think it's worth the price. Excellent flavor, smooth as hell!